Made a quiche lorraine today. Not so bad in preparation except for making the crust, not the premade frozen kind. Here comes the second and more difficult practical (having to start making the puff pastry in the am to finish in the pm. 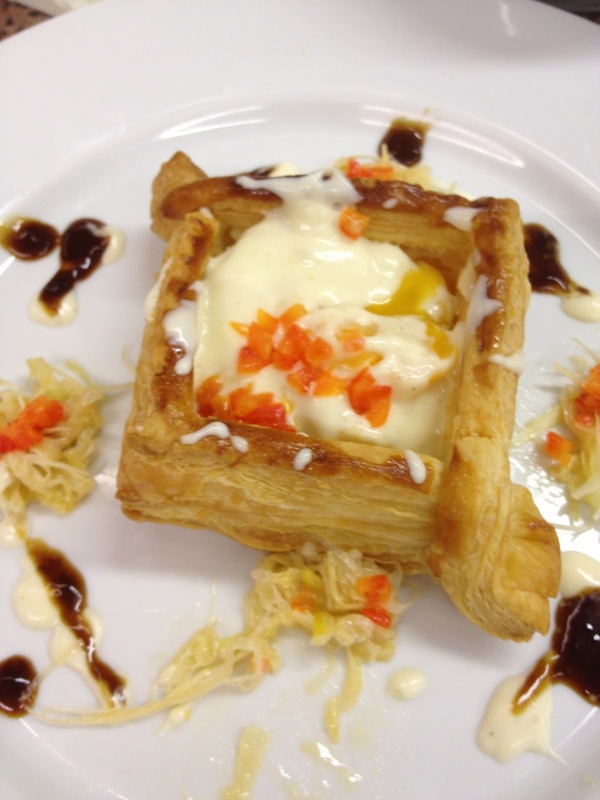 Puff pastry with leeks and poached egg and albufera sauce. It was the worst performance practical to date. I removed too much of the egg white, and it’s just plain ugly. Discussed with an upper class man about the love of food. He happens to be an anesthesiologist by trade. The revelation is that the medical field evokes an intrinsic fulfillment. Food and the act of eating is a shared extrinsic fulfillment. Technique, cautionary explanations of emergency protocol and use of our equipment, lasted 1 hour. YES!